August has been wonderfully lively. 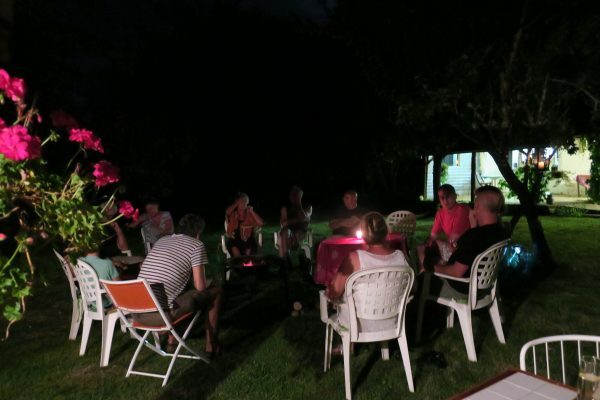 We’ve enjoyed many warm, starlit, friendly evenings with our guests. These, according to our Dutch campers are ‘gezellig‘. This is a fabulous word. It doesn’t have a direct translation into English. Some say cosy but it’s a bit more about atmosphere and how it makes people feel. 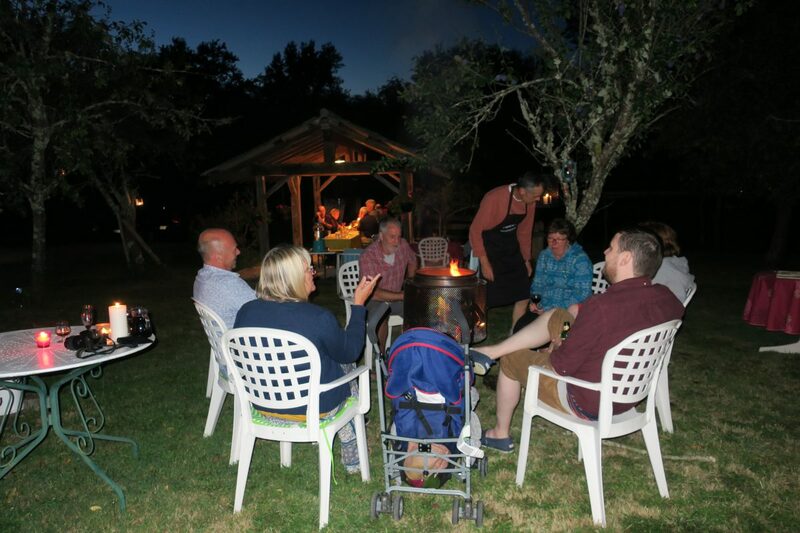 Our lovely Dutch guests have used it quite a few times now to describe our social evenings in the orchard which usually conclude with a gathering around the fire pit. We both need to learn more Dutch. Fiona has spent lots of time in Holland thanks to her sister, Alison and her nephew, James, who is Dutch, but we’ve both failed miserably to learn anything much apart from ” hello”, “goodbye”, “please”, “thank you” and “apple pie with cream”. 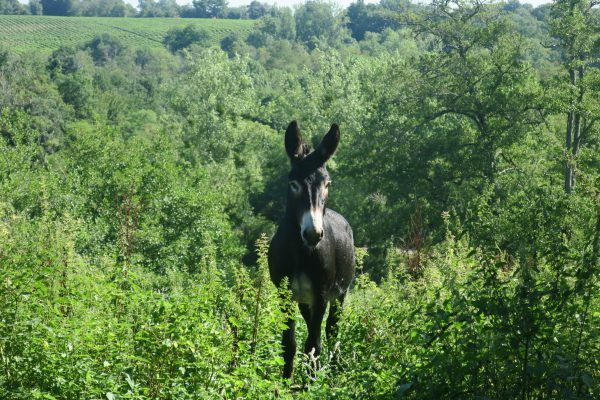 Mind you at least Fiona can hold a decent conversation in French – so maybe I shouldn’t be too critical. 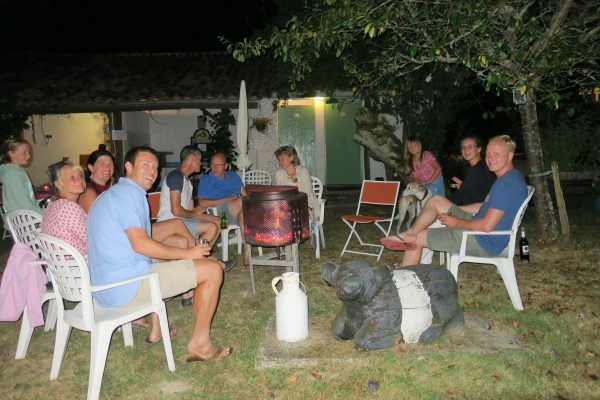 We’ve really enjoyed getting to know everyone who has rocked up at Le Poteau so far. All of our guests have been delightful and positive about the site. They are so thoughtful and respectful. The problem is that we get used to them being here and then they have to leave. It’s a bit weird, but something we should really have been prepared for as people on holiday do tend to eventually go home, However, they’ve said that they will definitely return. We certainly hope so. We are looking forward to new friends returning as old friends in years to come. Socially, it has been great. 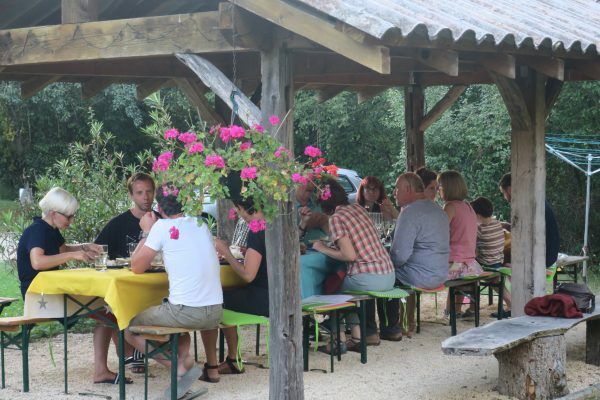 Our evening meals and Barbeques have been good fun and people have really enjoyed them. They are hectic and hard work but really worth it especially as they bring people together. We have also discovered that some of our guests are happy to really join in and provide a willing helping hand. Result! They know who they are and we really appreciate it. For the past fortnight we’ve loved having the first of the Downes offspring to visit Le Poteau – Ross, Jess, Harry and Rosie. Seeing our grandchildren running around exploring and playing with other children on the site was just great. This is the first of many visits and we can’t wait until the grandchildren are all old enough to fully lend a hand. Tractor driving training has already started. Our first long term (3 weeks) Bell Tent booking made us a bit nervous. What if it didn’t meet expectations? 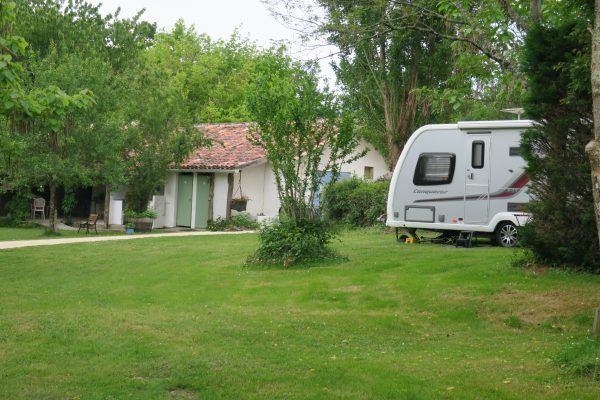 However, it all went swimmingly our fab guests said that we were the best campsite they’d stayed in in France (they’ve stayed in loads and have backed up their claim with a great, very detailed review on Trip Advisor!). We’ve had 7 Trip Advisor reviews so far and we’re delighted to say that each one has awarded us 5 stars – we’re hugely grateful to those guests who have taken the time to write such nice things about us. If any of you would like to leave a review of your stay you can click on the link to the following sites: Cool Camping, Pitchup, Google and Rustiek Kamperen. It has been a really steep learning curve as the season has stepped up. We may have tripped up a few times but nothing calamitous has happened so far…. The tractor did have another breakdown moment and much weeping and wailing was to be heard. However, it turns out that the tractor was protecting itself against the idiot driving it as it had run out of coolant so decided to stop rather than blow up. Which overall was probably a good thing. It will be quieter in September but their is so much that we want to do. We’re planning to re-roof all the old sheds to ensure they are completely waterproof and are looking at ways of adding an extra toilet and shower to the top campsite. Watch this space! The lovely Joel. Le Poteau’s Gezellig Manager.